County fairs have a special place in people’s hearts, especially 4-Hers. Many youth spend months preparing their animals for this big day. Selling a market animal can sometimes be an incredibly exciting and sometimes difficult time. What the public doesn’t see is all of the dedication and lessons learned from raising these animals. What spectators do see, however, is how the youth conducts themselves. Fair time should always be more than ribbons and prizes. Rudeness, unsportsmanlike behavior, dirty areas or animals, lackluster educational posters, etc can severely depreciate the experience for the public and fellow youth. 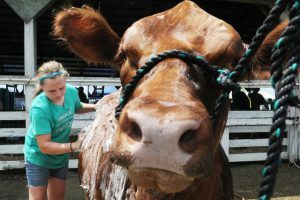 Many spectators watch the livestock shows or meander around the animal barns in-between rides. They marvel at all the creatures, comment on the smells, and watch the youth participate in showmanship; These are the moments that really count. Animals that are properly cared for and clean are impressive to the public. When youth show their animals their showmanship style and confidence are what is commented on and remembered. When youth communicate to the public this is their chance to showcase their deep knowledge and understanding. 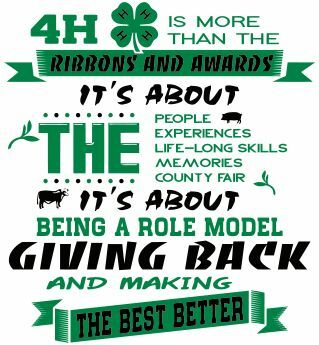 These are all wonderful opportunities for 4-H youth to shine! This is also a time where the public can witness other behaviors that affect the perception of individual youth or even entire county programs. Rudeness, unsportsmanlike behavior, dirty areas or animals, lackluster educational posters, etc can severely depreciate the experience for the public and fellow youth. Be kind to fellow showers. They have worked just as hard and deserve respect. Congratulate other’s successes and refuse the urge to complain or pout. Compliment each other and never put-down or make jokes at each other’s expenses. This kind of behavior goes against the 4-H code of conduct and will not be tolerated. Report any poor behavior to your agent or club leader. Lend a hand! No youth is born knowing 100% of what to do and many new showers attend each year. Be there with good advice or a helping hand if someone needs it. This can also apply to helping in other situations. Ask your agents or club leaders what you can do to help out. Maintain a clean area. This extends from your animal’s upkeep to even personal space. Use this time to present yourself and your hard work in the best way possible. Show respect to your animal. Nothing will tarnish your reputation faster than being cruel to your animal. The public will notice, your peers will notice, and you will be excused from the fair. Your animal is a living, breathing, feeling creature and should always be treated with respect. Smile, have fun and laugh. Yes, showing takes serious dedication and commitment but take time to enjoy the experience as well. Fair season is always here and gone so quickly. Use this time to better yourself beyond the ribbons. You do not win or lose, you learn.